In addition to the fundamental aspects of foot care (removing hard skin, trimming nails, etc. ), podiatry encompasses a range of more specialised services. If you ask a podiatrist which parts of his or her work require the greatest skill, creating prescription orthotics (also known as orthotic insoles and foot orthoses) for patients’ shoes is likely to be at the top of the list. Each pair is unique and potentially life changing. Custom-made orthotic devices are a world apart from the mass-produced alternatives from pharmacies and sports shops. A pair of prescription orthotics is a biomechanical medical aid designed for you and you alone. Thanks to their cutting-edge design and materials, bespoke orthotics offer superior foot support. People develop problems with their foot function as a result of their genetic make-up, physical stress, illnesses, injuries and poorly fitting footwear. They then find themselves in the frustrating position of experiencing pain or discomfort when being active. The purpose of custom orthotics is to correct abnormalities in the way you stand, walk and run so that you feel comfortable again. To use podiatrists’ terminology, orthotic devices align your foot and ankle in the most anatomically efficient position. Bespoke orthotics can treat existing problems (pain in the balls of the feet, sore heels or arches, foot fatigue and more) as well as reduce the risk of further issues occurring. Attempting to guess the cause of foot pain or buying off-the-shelf insoles can do your feet more harm than good. It’s always worth seeing a podiatrist instead. The key benefit of prescribed orthotics is that each one is specially moulded to suit the individual contours of each foot. Your podiatrist designs your orthotics using precise imprints of your feet and with your particular problems in mind. Moreover, they’re extremely versatile – one pair can usually be worn in many different shoes. Our prescribed orthotics service is a crucial part of the tailored treatment patients receive following gait analysis. With the aid of powerful video-based and pressure-based gait analysis technology, we conduct a detailed biomechanical assessment of your bones, muscles and joints to pinpoint irregularities and decide how best to treat them. For example, gait analysis may show that the pressure on your soles is unevenly distributed (causing pronation or supination), your feet and ankles are misaligned or your body moves asymmetrically. We can also diagnose children’s developmental problems, such as flat feet. In all those cases and more, patients can benefit from prescription orthotics. We make casts of each individual’s feet (a painless, straightforward process, as shown in The College of Podiatry’s orthotics video) to ensure that we create the perfect pair. Moreover, our orthotics are made from strong, light, high-performance materials, such as carbon fibre. We take aftercare seriously too – that’s why we offer a complimentary fitting and review. 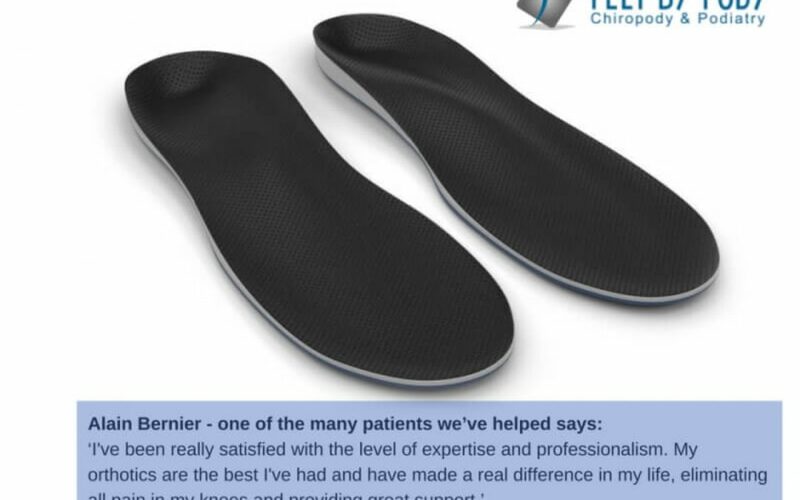 Finally, to give you a clear idea of the power of orthotics, below is a review from one of the many patients we’ve helped. For custom-made orthotics from an experienced London podiatrist, please call Feet By Pody today on 0207 099 6657 or book an appointment online.